“I don’t usually get to sit down at the Clinic,”states Jim Hartigan. “It’s nice to catch a quick break.” As THE Dentist at the Community Dental Clinic, Dr. Hartigan constantly is on his feet, supervising the work of as many as five dental and dental hygiene students from the School of Dentistry at VCU and the Danville Community College Hygiene Program at the same time. 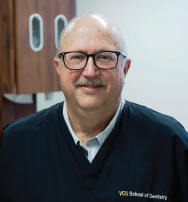 “With the VCU dental students and our two dental assistants, we are a team that handled more than 4,700 patient visits last year,” Hartigan says. “That’s probably 2–3 times as many patient visits as a dentist in solo practice can handle. “The key is the teamwork. Amanda Bryant of Ridgeway and Jennifer Dodson of Axton are outstanding dental assistants who are on their feet every minute also. By the way, both of them learned to be dental assistants right here at the Clinic. “But the glue that holds us together is Teresa White, the clinical coordinator,” Jim continues. White, a resident of Spencer, runs the Clinic. “After five years here, Teresa knows how to get things done.” Hartigan feels at home at the Clinic, and he should. He was the first dentist at the Clinic 12 years ago. “Public Health is a calling for me,” he says. His last trip was in 2010. “They don’t need me there any longer,” he explains. “I’ve taught the nurses, and now the nurses are teaching other nurses.” It’s like teaching someone how to fish is more important than giving someone a fish, he recalls. His daughter went with him to Ethiopia when she was 10. “She learned to look beyond the borders of America,” he says. Today, she’s a Registered Nurse at a hospital in South Bend, Indiana and the mother of the Hartigans’ two grandchildren. “The Dental Clinic is absolutely essential for the Martinsville-Henry County community,” Jim says. “During that first year, I could never imagine the need. The demand continues to increase. “We’re fortunate to have the leadership and guidance of Dr. Crabtree and Dr. Snyder, who are dedicated to quality dental health for everyone in our community.” Nearly all local dentists in Martinsville serve in a volunteer capacity. “It’s happened because of our leadership, certainly. But we would have closed without the financial support of the Harvest Foundation as well as other foundations, businesses, governments and individuals who care about others.